"As this is a feature on two of my most treasured items, it seems perhaps a bit odd to celebrate something that I don't physically own yet. Rather than pull something out of my wardrobe though, that I have worn to death, I wanted to use the opportunity to focus on a piece that I know will rapidly become a treasured possession. I have chosen a shirt from Lou Dalton's Autumn Winter 12 collection, that I became a bit obsessed with after seeing it at the show and eagerly purchased after being kindly invited to a private sales evening held by Lou and the equally talented Omar Kashoura. I have been keeping an eye on Lou's work for a number of seasons, each one seemingly moving closer to a personal aesthetic for her. Then, for Spring Summer 12, the collection had an industrial slant that I really fell in love with. There was a very British feel, references coming from miner's strikes and sub-culture from the UK, but with a sense of flamboyance. Pieces were in either black or white, keeping things clean and simple, but then embellished with gold zip detailing and the occasional splash of crystal. That glam factor is something that is quite hard to pull off in menswear, but culling references from the New Romantics, with what seemed like a bit of 70s rock, the collection worked it well. For Autumn Winter 12, the season's collection maintained a bit of that industrial Britishness, but took it in a more military direction. The story behind the collection is of an Officer who absconds from his post and ends up living a rural life in hiding, caught up in a whirlwind romance. Drawing on that, Lou has worked in classic military ideas set against countryside silhouettes, but also managed to include two of my favourite films, My Own Private Idaho and A Taste of Honey, as further references. Heavy knits, quilted fabrics and contrasting layers came through, again in that toned down colour range. It is a collection that is really diverse in its inspirations and I loved that. 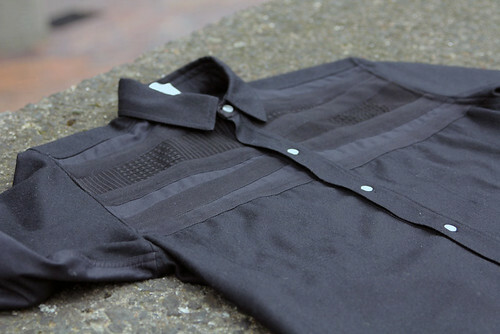 The shirt I chose is a heavy wool work shirt, slightly oversized, black, with tonal buttons. The collar is cut really beautifully, not too small so as to be 'on trend', but not too overgrown keeping it away from that 70s Dad feel. Basically, that collar makes it timeless. Across the chest is a strip of appliqued fabrics and embroidered detailing, and it is this that makes the shirt really stand out. The embellishment feels disjointed, it is in keeping with the rest of the piece and accentuates the fit really nicely, but is slightly abstract in its placement. The different strips of fabric contrast both each other, some tough some quite feminine with embroidery, and the workwear feel of the shirt itself. This is basically what I love about Lou Dalton. Something really simple, but with an element that directly references the story she builds around a collection and shows off her ability to make interesting, beautifully crafted and completely succinct menswear." "As I chose something that I didn't physically have in my hands, it seemed appropriate to also include something that has become an absolute staple for me. I grew up being addicted to trainers, from garish neon yellow and black Nike's through to anything limited edition I could get my hands on. As I entered (slightly) older age, I managed to tone down my obsession and restrict myself to pretty much only buying white Reebok Workout Plus. Basically, the trainers of Essex footballers, builders, plumbers and most of North London. Literally the most comfortable trainers ever and really nicely designed, but, ultimately, a little bit rough. 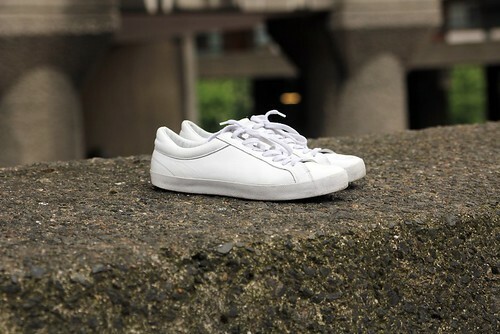 Being made more than aware of the power of a pair of white trainers by the Reebok's, when I started looking around to find something that fitted the bill of being clean, simple, white but pleasantly quiet as opposed to 'a little bit rough', I came across Erik Schedin. Yes, there are a number of label's that do a nice simple white trainer, but Erik's are super light and feel like wearing luxury. They go with pretty much anything, are supremely comfortable and when he first started, refused to make them in any other size apart from his own, a 44, as he felt that was the perfect size for a pair of shoes. I also always go for an obsessive. Completely unbranded, clean and understated, they are literally the perfect white trainer."